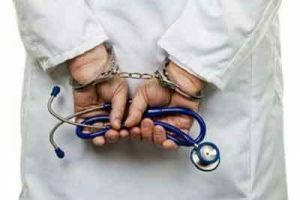 Gorakhpur: Former head of anaesthesia department at the state-run Baba Raghav Das Medical College Dr Satish surrendered in a local court here, taking to five the number of those held in connection with the death of children in the hospital. “Apart from this, evidence gathering is going on,” he told PTI. Before Satishs surrender, the police had arrested four of the nine people named in the FIR related to the death of over 30 children within 48 hours beginning August 10. Last week, the Uttar Pradesh police had nabbed Sudhir Pandey, a clerk of the BRD Medical College, in connection with the deaths. Pandey was named in the FIR filed in the case and was arrested from near Khajanchi Chowk under Shahpur police station area here on a tip-off. The UP police on September 2 arrested Dr Kafeel Khan who had been earlier removed from his post in the state-run hospital. The Special Task Force of UP police had on August 29 arrested the former principal of the college, Rajiv Mishra, and his wife, Purnima Shukla. Mishra was suspended as principal of the medical college on August 12 after the deaths were reported. He resigned the same day taking moral responsibility. There were allegations that the deaths occurred due to disruption in oxygen supply as the vendor had not been paid for several months. While the Uttar Pradesh government vehemently denied that shortage of oxygen led to the deaths, a high-powered probe committee headed by the chief secretary indicted Mishra and others on charges of laxity among others. Mishra was accused of sitting over the issue of payments to the vendor supplying oxygen gas to the hospital. The medical college attracted global attention when more than 60 children, mostly infants, died at the hospital within a week last month. The issue also acquired a political colour with the opposition attacking the government over it. There were allegations that the deaths occurred due to disruption in oxygen supply as the vendor had not been paid for several months. While the Uttar Pradesh government vehemently denied that shortage of oxygen led to the deaths, a high-powered probe committee headed by the chief secretary indicted Mishra and others on charges of laxity among others. Mishra was accused of sitting over the issue of payments to the vendor supplying oxygen gas to the hospital. The medical college attracted global attention when more than 60 children, mostly infants, died at the hospital within a week last month. The issue also acquired a political colour with the opposition attacking the government over it. The UP police on September 2 arrested Dr Kafeel Khan who had been earlier removed from his post in the state-run hospital. The Special Task Force of UP police had on August 29 arrested the former principal of the college, Rajiv Mishra, and his wife, Purnima Shukla. Mishra was suspended as principal of the medical college on August 12 after the deaths were reported. He resigned the same day taking moral responsibility. There were allegations that the deaths occurred due to disruption in oxygen supply as the vendor had not been paid for several months. While the Uttar Pradesh government vehemently denied that shortage of oxygen led to the deaths, a high-powered probe committee headed by the chief secretary indicted Mishra and others on charges of laxity among others. Mishra was accused of sitting over the issue of payments to the vendor supplying oxygen gas to the hospital.